At Provincial Locksmith in London, we understand the stress involved in losing your keys, or having your house broken in. We’re here to help you gain access and security, as well as feel safe again. With over 35 years of experience in the business, we know that providing quality workmanship and reliable locksmith products is about giving you a sense of security. From installing garage and side doors to implementing master key systems, call Provincial Locksmith. Whether you’re a homeowner, property manager, or business owner, we can help you install keyless entryways or high-security locks for your filing cabinets. Protect your documents, cash registers, safes, and more with our high-quality products. We carry trusted product brands such as Mul-T-Lock in our store. 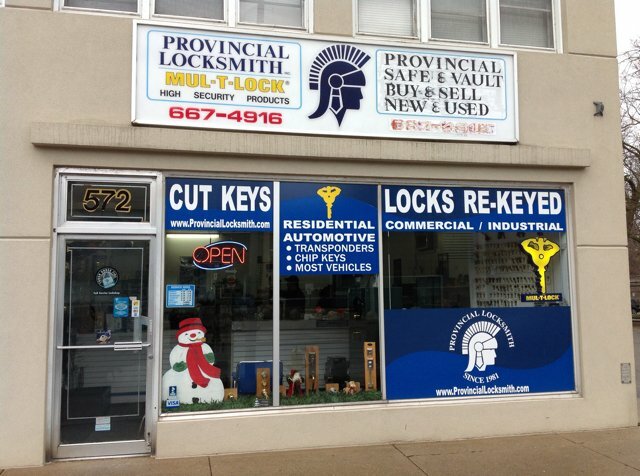 Come visit our London location to see our stock or to duplicate your keys. We also offer mobile service, so please call us if you need help within London and surrounding area. To set up a business account with Provincial Locksmith, please download our Credit Application form here.